Gordon “Corky” Rodgers was passionate about the natural world. His passion was evident both through his outstanding career with the Ontario Ministry of Natural Resources and in his retirement where he applied his skills to his local lake association, a regional stewardship council, and consulting on projects to rehabilitate failing fresh water systems. When he passed away in April, his family wanted to create a permanent legacy for him. They reached out to the Community Foundation and we responded by immediately setting up a temporary fund to receive memorial donations while the family tended to other pressing matters. Donations poured in from family and friends; many sent with beautiful remarks about Gord which we shared with the family. In total, over $12,000 was raised. 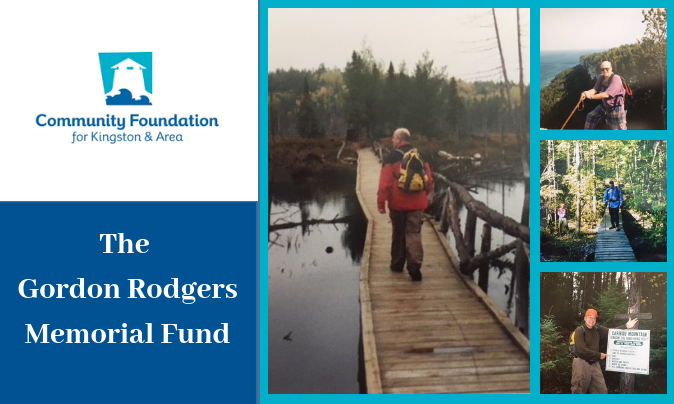 After exploring their options, the family decided to establish the Gordon Rodgers Memorial Fund as a permanent endowment fund with the annual income directed to the Cataraqui Region Conservation Authority to enhance the experience of trail users on the Cataraqui and K&P trails, which Gord loved.